Tore West & Anna-Lena Kempe (2005). Theoretical and methodological perspectives on designing video studies of interaction. International journal of qualitative methods 4 (4), 87-108. A software tool (Analyzing and Reporting Transcription Tool, ARTT) was created to handle transcription and analysis of the large amounts of video data systematically and transparently. We used a combination of common office software, since none of the software available at that time could do the type of analysis needed from our theoretical perspective. In a later version the different functions were fused into a single software program (The Analytical Transcription Tool, TATTOO). 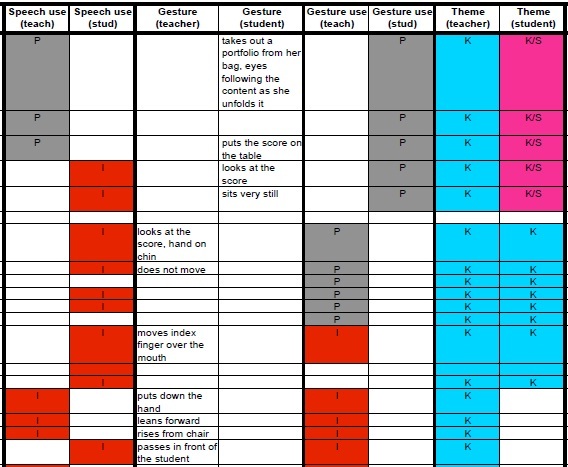 Video recordings of interaction within a classroom setting generate vast amounts of multimodal data, and as a result many choices had to be made about how to represent, describe, analyze, and interpret the data systematically. An ambition was to make the research process transparent to facilitate critical reading. This also reflects an ethical ambition to aid in following the transformation of the actions of the informants through the processes of transcription and analysis, on to the presentation of results and discussion of implication for practitioners. To reduce the amount of information, we needed to focus the area of interest by making strategic theoretically informed decisions before recording the video, and before deciding the method of analysis. All systems for analysis are more or less impregnated with assumptions and theories, as each bring different data to the forefront. It was therefore necessary to take into account the theoretical background of the decisions resulting in any software solution for data handling and analysis. An Excel spreadsheet was programmed to contain connected fields for transcribing and coding separate modes of interaction. It is designed to facilitate the recognition of patterns in the interaction by assigning a color to each of the analytical concepts used for coding each utterance. The possibility of viewing different modes next to each other gave an overview that could graphically reveal patterns in the interaction. The Excel sheet was programmed so that it could calculate the time code format with hours, minutes, seconds, and frames. The complex transcript and coding chart was programmed to display combinations of fields needed for different tasks while hiding other fields, using keyboard commandos to switch between different views. Short commands were also used to speed up the coding process. Quantitative calculations could also be accomplished in the spreadsheet, with statistical output of durations and frequencies as well as referential and correlation analysis of several aspects of interaction. Output from such calculations and analysis could also be displayed in several types of graphs. The Transcription bank provides a platform for researchers to reflect on and compare different forms of multimodal transcription. The commentaries are written by the transcribers themselves. If you would like to share your reflections on a transcript you have made please contact us.